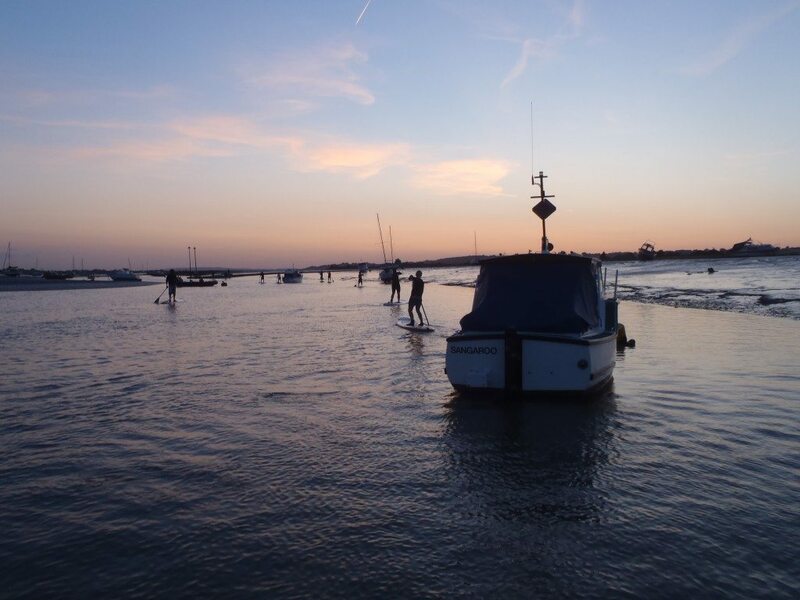 Another sublime SUP Club last night as 22 paddlers took on the c. 5-mile route from Thorpe Bay to Southend Pier and back – not an easy paddle, and a massive well done to all 20 that made the distance! We hooked up on the rigging green at Thorpe Bay and started to launch at 7pm on a falling tide with the remnants of a sea breeze blowing us west towards the pier. The group strung out along the coast as a few of us hung back to wait for the late arrivals (!) until eventually our flotilla were all paddling into a blinding sun. 30-45 minutes later we were hanging out under the pier … where we even got a salute from the train driver as he clanked over our heads. As the sun dropped in the sky and the tide started to rip out, we headed for home with a strong current to help us back against a strengthening north-easterly breeze. With the sun at our backs we all dug in for a sociable cruise home, chatting in small groups as we paddled. Some charged the distance – notably Tanzi and Julia, who are representing Team Wet’n’Dry SUP at this weekend’s Bray Lake Ultra 16-mile race: good luck to both of them! So after a wet and blustery day on Wednesday 4th June, the eleven of us who ventured out to brave the elements were more then happy to find the skies clearing and the sun coming out just as we launched at a new spot on the River Chelmer, about a kilometre upriver from our usual spot at Paper Mill Lock. With an easy launch off a low grassy bank we started our journey into the wind, and paddled a couple of locks up to our turning point – on this occasion just within sight of the A12, as we wanted to get back to the vans to comfortably pack up and make the pub before they stopped serving dinner! Suitably motivated, we charged back with the wind behind us, making the total paddle about an hour and a half. It was good to see Jim fearlessly practising his step-back turns this week, although he’ll have to work super-hard to compete with step-back Stu who made a welcome return to SUP Club after his winter gym sabbatical! And congratulations to Claire on her glorious return to SUP Club, having won the 2-mile race at the Battle of the Thames last month. To round off our beautiful sunny paddle, we all headed to The Generals Arms pub in Little Baddow for a well-earnt pint, a lovely meal, and plenty of post-paddle chat…. 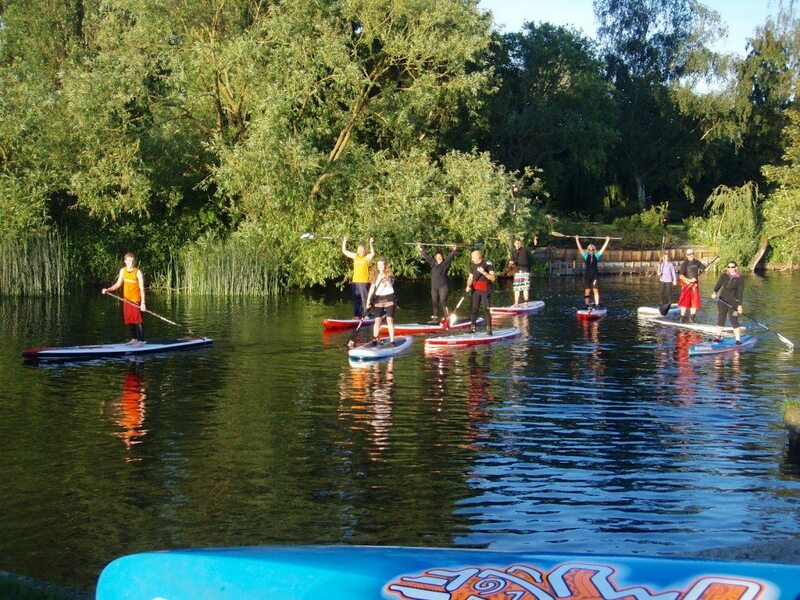 This week’s SUP club was a technical sessions, in which we all practiced our technical turns and paddle technique. 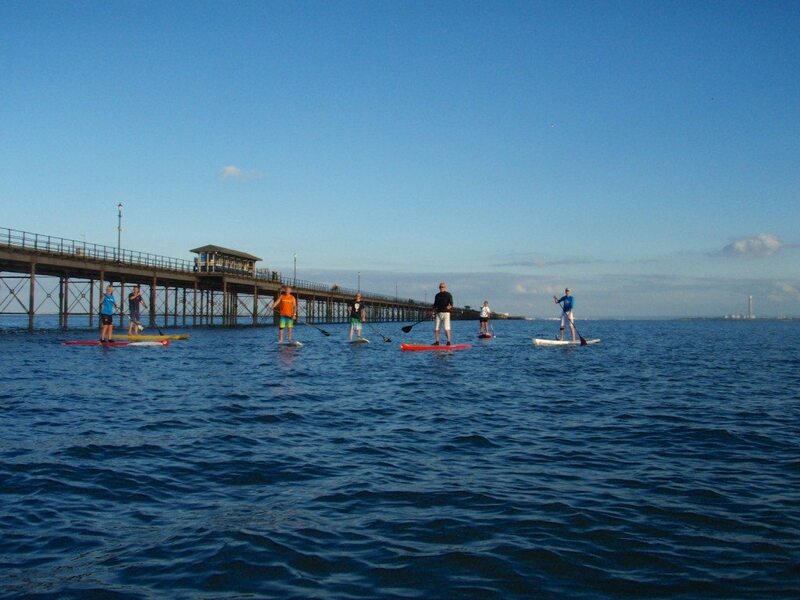 Over 20 paddlers turned up for a great paddle out to the Ray. Once at the Ray we all stopped for a little bit of a muck around, everyone did really well with their step-back turns and reverse sweep turns. There were even a few fun races between bouys which everyone enjoyed. It was good to see so many people out on the water practicing their technique, we will have a 20 strong race team before you know it. Also a lot of new riders came this week which was good to see, keep up the good work! After a lovely paddle it was time for a fully deserved beer down in Old Leigh to finish the evening off nicely. 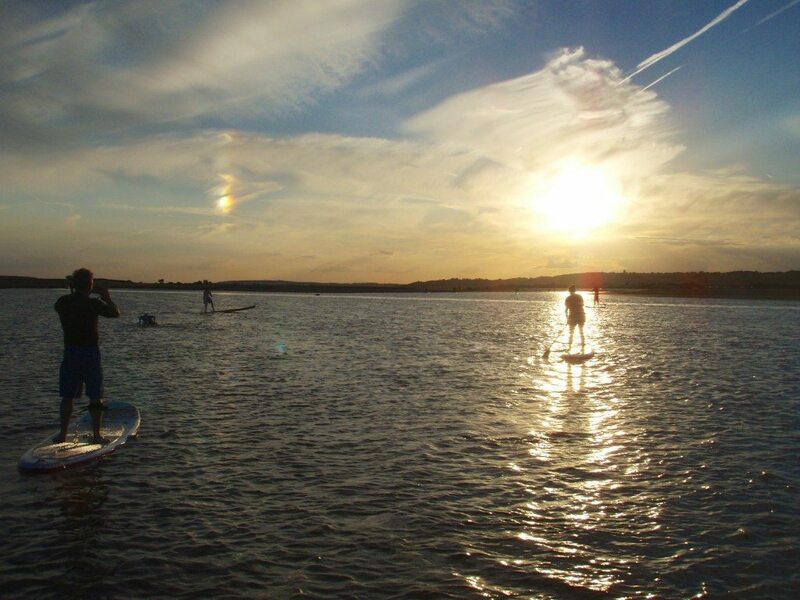 If you’re interested in joining in on a Wednesday night SUP Club, all we ask is that you have some paddling experience (if not, check out our SUP Lessons) – we call the SUP location on the day on our Facebook page and Wet’n’Dry SUP calendar, location depending on weather and tide conditions. If you have your own kit, just turn up and you’ll be very welcome. 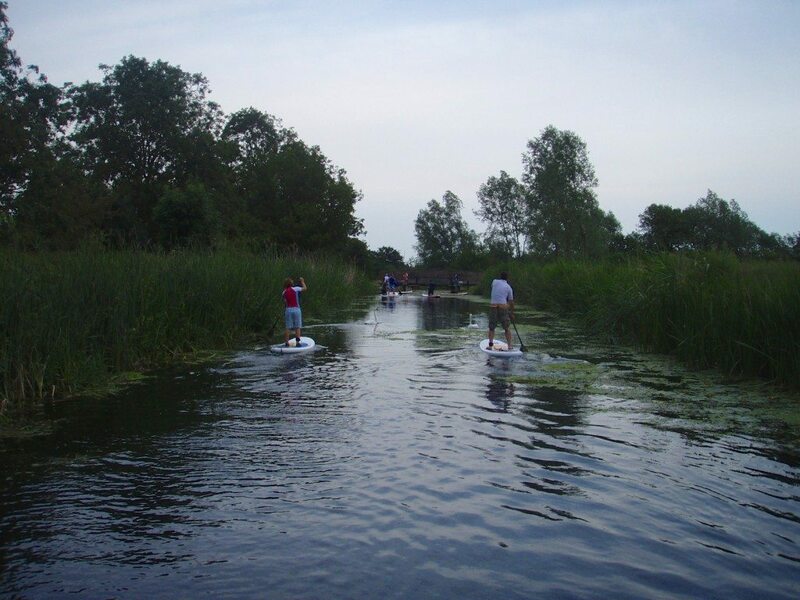 If not, we do offer limited SUP hire for £25. For more information give us a call on 01268 569988 and we will happy to help.